The occupation of an empty federal building by protesters of government land rights abuse ended last week with the surrender of the protesters to the government. The protesters had probably not counted on the willingness of the feds to murder them in cold blood when they began their ill-fated project. Transits against the chart for the beginning of the occupation, at the time of the departure of the last protester are interesting. 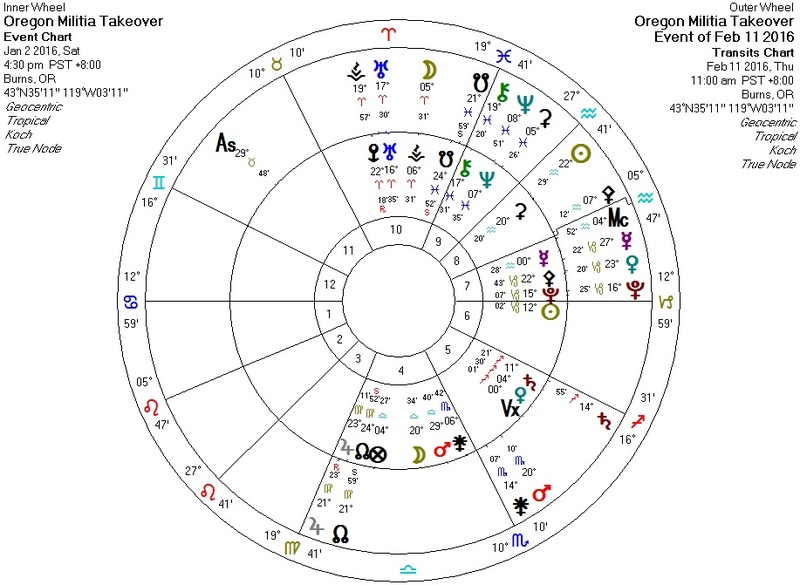 Transiting North Node stationary, closely conjunct transiting Jupiter, both conjunct North Node and Jupiter on the IC of the occupation chart: both Jupiter and the IC have connotations of death, and the North Node suggests karma. Transiting Mars tightly square Ceres on the occupation chart, transiting Sun conjunct said Ceres, and transiting Moon semisquare said Ceres: I don't know of anyone who has really mapped out what Ceres does, but I tend to notice that she tends to be in aspect with both the Sun and Moon when people or things "go away".